While researching my paternal 5th great grandmother Margaret Schaad (or Schad, Shad) and her siblings, I came across a slave manifest on ancestry.com dated 1824 for the transportation of three slaves with Solomon "Shad" listed as "Owner or Shipper." Margaret had a brother named Solomon, but he died in 1768 in Wilmington Island, Chatham County, Georgia. I don't have a spouse or children listed for him, but some family trees on ancestry.com list a son also named Solomon. 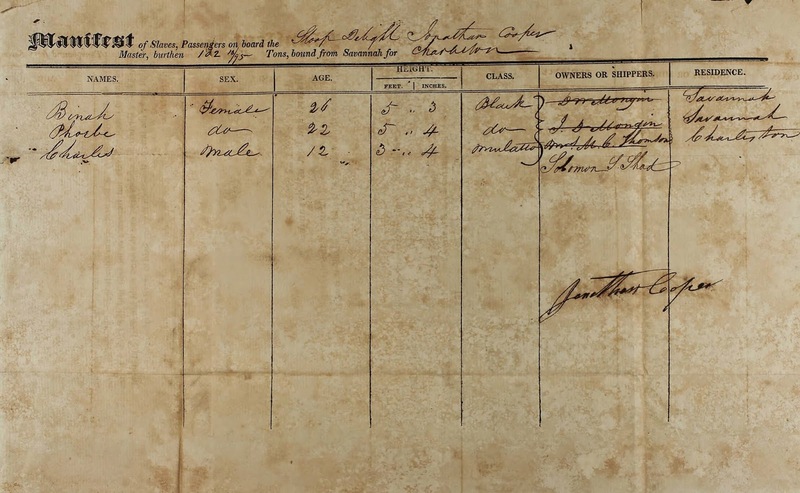 According to the slave manifest, these three slaves were being sent to Charleston, South Carolina, from Savannah, Georgia (click on the images for a larger view). The name of the ship was the Delight. What a horrible name for a ship used to transport slaves! The owner of the ship was Jonathan Cooper. There are several slave manifests on ancestry.com with his name on them and for this ship going back and forth between Savannah and Charleston. 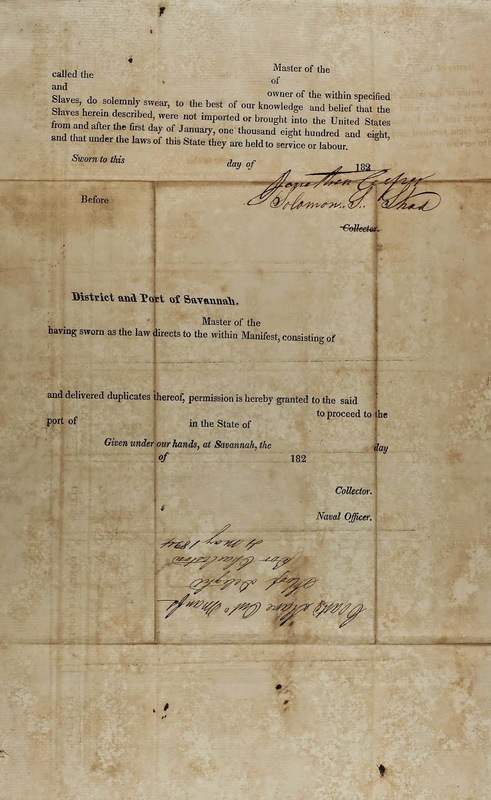 Notice that the above says the shippers and owners had to swear that these slaves had not been brought over to the United States on or after January 1, 1808, which is when the act to abolish the importation of slaves into the United States went into effect (not to say that importation ended right away). This is the handwritten bottom portion of page 1 (see above). It says, "Coast[?] 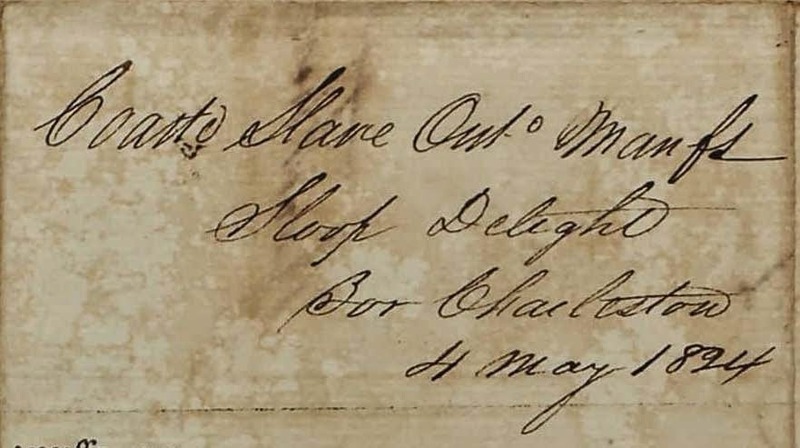 Slave Out Manfs, Sloop Delight, For Charleston, 4 May 1824"
The names of the "Owners or Shippers" have been marked out and Solomon Shad's name is written underneath. Binah's owner was D. W. Mongin, Phoebe's owner was J. D. Mongin, and Charles' owner was Mrs. M. C. Thomson (if I'm reading them correctly). I found a Daniel W. Mongin and a John D. Mongin in Savannah, Chatham County, property records. I had trouble pinpointing who Mrs. M. C. Thomson was. Those could be her husband's initials. I found a "Miss C. M. Thompson,"a "Mrs. C. M. Thompson," and a "Mrs. M. C. Thompson" in Chatham County property records. I wonder why Charles' residence says Charleston while the others say Savannah. Unless that's where the owners lived whose names were marked out. I can't imagine at the age of 12 being shipped off to parts unknown and Lord-knows-what without my parents.